A STROKE OF GENIUS Numerous coast guards, police departments and other security forces around the world rely on the outstanding power, performance and durability of BRP's Evinrude outboard engines for marine-patrol duty. To complement its regular line-up of rugged outboard engines, BRP offers government and commercial customers several special models, including two that feature multi-fuel capability. Suitable for use in demanding mission conditions, the multi-fuel engines are designed for stealth operation with minimal operating noise and low-reflection tactical black paint.They are also available with optional pump-jet propulsion instead of a propeller. Whatever the nature of your mission, Evinrude engine's reputation for superior quality, reliability and performance makes the decision to power – or repower – with Evinrude an easy one. BRP's proprietary E-TEC direct-injection technology delivers all the power and performance advantages long associated with two-stroke outboards – plus exceptionally clean and quiet operation usually found in four-stroke outboards. 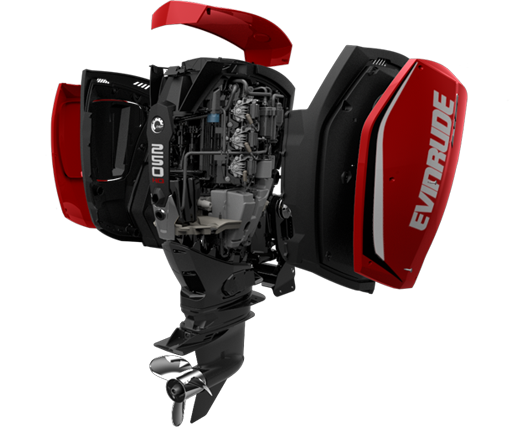 Evinrude E-TEC engines utilise a fully stratified combustion mode for slow- -speed operation, combined with a homogeneous high-speed system to achieve decreased emissions and increased fuel efficiency across the entire operating range. Other state-of-the-art features include high-performance iridium spark plugs and a fast-rise, induction ignition system that make for smoother running, increased fuel economy and longer spark plug life. Advanced, ball-in-plunger (BIP) fuel injectors deliver added power along with enhanced reliability and run quality. The E-CAL multi-point auto lube system eliminates the need for mixing oil and gas. Oil is metered directly to critical engine points while complete combustion ensures that you use only the precise amount required and that no oil ever escapes into the environment. You never need an oil change! Along with auto lube, Evinrude E-TEC engines feature new T-design cylinder sleeves that strengthen the cylinder bore geometry for increased durability and longer engine life.